NGC 3718 galaxy pair...TEC 140 @f7 and FLI ML8300 camera. Taken by Lynn Hilborn, WhistleStop Obs, Grafton, Ontario on March 17,2013. LRGB Lum 12x10m 1x1, RGB 8x5m each 2x2. NGC 3718 and its companion NGC 3729 are physically related members of the Ursa Major galaxy cluster. The two galaxies appear to orbit each other at a projected separation of 147,000 light years. NGC 3718 seems to have a rudimentary bar and spiral structure although it is recognized as a peculiar galaxy and as such is listed within Arp's Atlas of Peculiar Galaxies. Its most prominent feature is its extraordinary dust lane and strongly warped disk which gives an S-shaped appearance. The dust lane runs through the entire stellar bulge of the galaxy and stretches some 80,000 light years in its full extent. The disk is seen almost edge on at the center and is strongly warped to almost 90 degrees, a situation quite unique among galaxies. The peculiar dust lane covers a large part of the galaxy's main body and extends all the way into the nucleus. Because of the strong warp, features seen close to the nucleus are actually far from the center being seen in projection. The warp is also present in the very complex gaseous infrastructure of the galaxy observed at radio wavelengths. Three dimensional reconstructions of the galaxy suggest that in some viewing angles its appearance may seem quite normal suggesting that other galaxies with similar severe warps could go unnoticed. Warping of galactic disks is a relatively frequent phenomenon although the cause of disk warping is still uncertain. Warping in most cases is believed to be due to tidal forces exerted by neighboring galaxies. In the case of NGC 3718 the most reasonable explanation is its close proximity to NGC 3729 which is likely responsible for the strange configuration of the galaxy. Other explanations for warping such as twisting forces exerted by massive outer halo structures has been suggested and may possibly play a role. The prominent dust lane of NGC 3718 is remarkably similar to another well known southern galaxy, NGC 5128 (Centaurus A), which is considered to be its southern counterpart. NGC 3718 contains an active galactic nucleus (AGN) and is known as a Seyfert type 1.9 galaxy. HI mapping of the galaxy shows a suggestion of a tidal tail that starts on the eastern side of the galaxy and extends north towards its companion NGC 3729 strongly suggesting a gravitational relationship between the two galaxies. 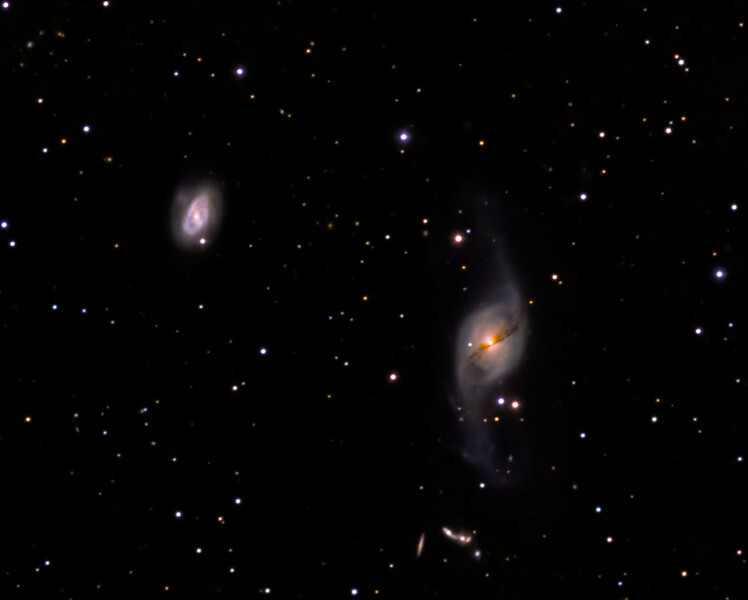 A grouping of 5 background galaxies 300 million light years distant are projected to the south of NGC 3718 and are designated Arp 322 (also Hickson 56). Several members of the group appear to be a strongly interacting. This field of interesting galaxies highlights the collection of peculiar galaxies published by the American Astronomer Dr. Halton C. Arp. In 1966 Arp published a catalog of 338 unusual or peculiar galaxies and interacting groups using film images taken by the Palomar 200 inch telescope. Description with permission of Dr. Robert Gendler.